There are hundreds of stories being told during the planning and anticipation of the 2017 NFL Draft. 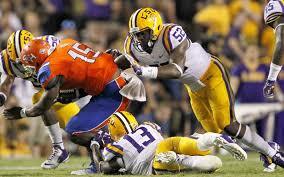 Today we will be looking at a scouting report for senior linebacker Kendell Beckwith, LSU Tigers. LB-Kendell Beckwith, LSU 6’2” 252 lbs. Cons: The multiple knee injuries are certainly a concern, as is the backer’s tight hips that prevent him from changing directions quickly. Flowing up and down the line of scrimmage is one of the most important roles of a linebacker and his ability to do so might be limited early until he fully recovers. Beckwith sometimes lets his pad level get too high, which allows offensive linemen into his body that makes him easier to block. He shows great patience waiting for a play to develop; however it makes him vulnerable to getting washed out before the backer recognizes what happened. His tendency to gamble on snap counts and guess where the pigskin is going occasionally leave the rest of the defense in an awkward spot. Beckwith may be able to cover many NFL tight ends in passing situations, but he will be too stiff against elusive backs. Although the backer sometimes lined up on the outside, he is a better inside backer. Pros: This three-year starter is a team leader that has short area burst. The former Tiger is a power tackler that explodes through his opponent’s hips using his shoulder pads and wraps up. It looks like he knocks the wind out of his prey. Beckwith is very effective on run blitzes that allow him a clear shot at the ball carrier. His motor runs high which is evident with how quickly he gets back up after being knocked to the ground by blockers and chases down the play twenty or thirty yards away. The linebacker drops back quickly into pass coverage and might be best fit as a SAM (strong side inside backer in a 4-3 system). Overall impressions: This year’s inside linebacker crop isn’t very deep with impressive starters, but Beckwith certainly can grow into a useful defender in the right system. When he is fully recovered from his knee injury, the backer should see plenty of playing time. Since we don’t know when he will be healthy, I would draft him as a reserve that I can store on my taxi squad this season. Thanks for reading. I will continue to discuss my scouting reports with you throughout the next several months, so keep checking the site for more content. Please check out my other content as well. You can also follow me on Twitter @AndrewMiley.